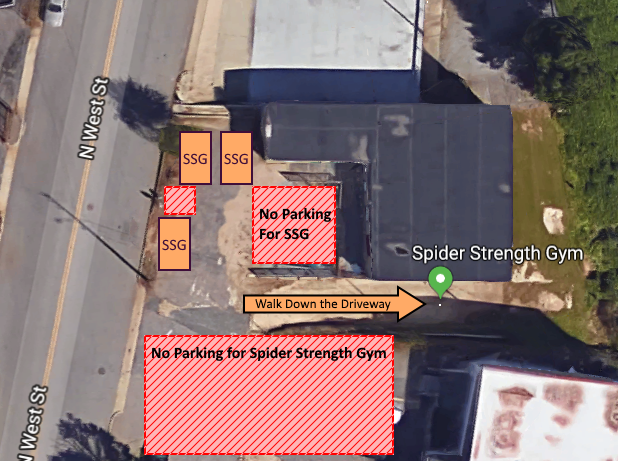 Spider Strength Gym is the Raleigh area’s premier strength gym, catering primarily to powerlifters, weightlifters, and strongman competitors. All memberships offer 24 hour keycard access. Standard Membership – 24 hour, unlimited access to the facility. Dual Membership – 24 hour, unlimited access for two adults in the same household. Partial Membership – 24 hour access for occasional visits, up to 5 per month. Spider Strength Gym is an unstaffed 24 hour gym. Please schedule a tour or email spiderstrengthgym@gmail.com for more information. Located at the bottom of the steep driveway on the south side of the 804 building. Most of the parking is on street. Please be respectful and obey city parking signs.